Locations of fights reported within 90 minutes after the Center on Halsted's (red box) closing time Wednesday. They're baaaaaack. Most Chicago public school students enjoyed their last day of the school year Wednesday. It took mere hours for Wrigleyville and Boystown's "youth" shelters to draw some of the students to our part of town. Last night would have been a completely uneventful night for police in Wrigleyville and Boystown, except for the fighting. Six fights and a cab attack were reported within two blocks of the Center on Halsted in the 90 minutes that followed its 9 o'clock closing. 9:00PM: Editor's note. The Center on Halsted closed for the night at this time. 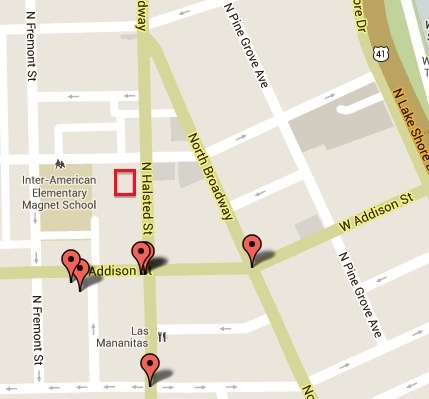 9:13PM: A group of 18 people was reportedly fighting in the Circle K/Shell gas station lot at Halsted and Addison. Officers arrived just in time to see the crowd disperse. 9:52PM: Two females were reportedly "getting ready to fight" in the parking lot of Lakeview Lutheran Church, 835 W. Addison at Reta Avenue, home of "The Crib" shelter for "youth" aged 18 to 24. 9:58PM: A fight broke out in front of Caribou Coffee, at the intersection of Halsted and Cornelia. 10:33PM: Another fight broke out in the Circle K/Shell gas station lot. 10:33PM: A cab driver reported that someone broke out one of his vehicle's windows as he sat in traffic at Addison and Broadway. He followed the person responsible to the Circle K/Shell gas station and waited for police. UPDATED 20 JUNE 2013: Added map and Center on Halsted closing time.